Soldiers from the 25th Infantry Division's 3rd Brigade Combat Team in 2006 spent more than three weeks at the National Training Center near Death Valley in California to prepare for its first Iraqi deployment. Throughout this month the same brigade will be back at the desert Army training center preparing to head to Iraq in November for another year's combat tour. More than 3,600 Schofield Barracks soldiers from the 25th Infantry Division's 3rd "Bronco" Brigade Combat Team will begin the first phase of pre-deployment training tomorrow in the Mojave Desert near Death Valley in California to prepare them for a yearlong mission to Iraq. » Location: Fort Irwin in Mojave Desert, Calif. The soldiers from the "Bronco" Brigade along with another 1,000 aviators and other specialists from the 25th Combat Aviation Brigade and the 45th Sustainment Brigade will be at the National Training Center at Fort Irwin in Southern California until the end of the month. The 3rd Brigade is commanded by Col. Walter Piatt. 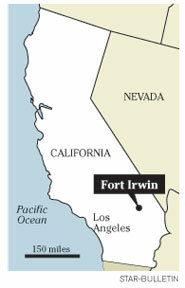 The National Training Center is located in the Mojave Desert near Death Valley 150 miles northeast of Los Angeles. The Army said the training will include "live-fire and situational exercises emphasizing support to host nation government and security forces, such as military operations in an urban environment, defense against improvised explosives and cultural awareness." The brigade will spend about a week in the Fort Irwin barracks area replicating what it will have to do at staging points in Kuwait. Then the soldiers will drive by convoy on Aug. 9 into an area at Fort Irwin known as the "box" -- a training area the size of Rhode Island. The brigade will be assigned to several of the six replicated forward operating bases in the "box" and then spread its companies to work in 13 mock Iraqi villages until exercise ends on Aug. 22. Within the 1,100-square-mile "box" there are 13 villages built out of shipping containers, railroad cars and storage sheds. The villages are inhabited by 700 role players, some of them Iraqi expatriates, who will add authenticity during the Schofield Barracks brigade's three-week training rotation. 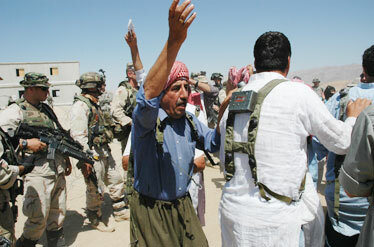 The villages were constructed three months after the U.S. invaded Iraq in 2003. The Army employs 1,250 soldiers and 700 civilians whose job is to provide a realistic experience for the Tropic Lightning soldiers. They live in the mock villages and are not allowed to speak English when communicating with 3rd Brigade soldiers. The 13 villages can replicate the problems facing a company commander with about 120 soldiers. An urban complex with several hundred buildings is now being constructed and is designed to replicate the problems facing a brigade commander, who commands 4,500 to 5,000 soldiers. Two years ago, another set of soldiers from the 3rd Brigade Combat Team trained at Fort Irwin before it was sent to Iraq. Pfc. Alexander Creighton, 23, was killed and nine other soldiers from the 3rd Brigade received minor injuries on May 11, 2006 when the truck they were in rolled over and caught on fire at the training center. It was the National Training Center's first training death since 2003. The Schofield Barracks' 3rd Brigade returned in October from a 15-month deployment in Iraq. It will spend barely 12 months at home before heading out again. The unit arrived in Iraq in August 2006 in what was supposed to be a 12-month tour, but as part of the Pentagon's "surge" strategy, its tour was extended by several months. Thirty-six soldiers serving with the 3rd Brigade and other Schofield Barracks units died during the nearly 15-month deployment. Maj. Cathy Wilkinson, 3rd Brigade spokeswoman, said at the end of the training at Fort Irwin all of the soldiers will go on "block" leave for nearly three weeks. A deployment ceremony at Schofield Barracks' Sill Field is planned for early October before the 3rd Brigade leaves Hawaii by chartered commercial jets for a 12-month tour in Iraq. Lt. Col. J.B. Vowell, the brigade's deputy commander, said he expects the brigade to be located in the area north of Baghdad and possibly assigned to the Multinational Division-North, which will be commanded by Maj. Gen. Robert Caslen, who also is head of the 25th Infantry Division. He and 1,000 other soldiers from his headquarters staff will also be deploying and will be stationed in Tikrit.